The OEM Collision Repair Roundtable, a 20-year-old gathering of 28 makes worth of OEMs, is examining its members using more consistent symbols in their repair procedures, General Motors reported in its most recent GM Repair Insights magazine. Repairers had complained about the disparate icons and keys, leading to discussion of the matter at the January quarterly Roundtable gathering, according to GM Repair Insights. “One OEM might use an X, for example, where another uses a T,” GM customer care and aftersales collision manager John Eck told GM Repair Insights. “The Roundtable is now working on a way to consolidate that information,” GM wrote in the magazine. The OEM also “is examining include helping shops and customers locate the most reliable sources of repair data,” GM reported, noting that the body already had created the shop-facing OEM1Stop.com and consumer-facing CrashRepairInfo.com. I-CAR also appears to have made a pitch for greater OEM consideration of repairers’ needs during the Great Designs in Steel held last month, based on slides shared by the Steel Development Market Institute. 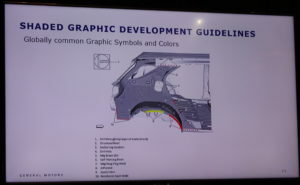 The presentation by Jason Bartanen, I-CAR industry technical relations director, also references a 2017 GDIS presentation that called for greater standardization. Check both of them out and see how I-CAR showed the flag.